Indiana Conference - Recent NEWS! Seventh-day Adventist Church in North America Releases Statement on Unrest in Ferguson, Mo. “As a part of the larger family of America, Seventh-day Adventists grieve with Michael Brown’s family and extend our heartfelt condolences for their tragic loss. We are praying for our Ferguson community family who are in such great pain. “We pray that justice will replace injustice, that truth will replace deceit, that inequality will be replaced by equitable brotherhood and that God's peace will prevail. We pray that the deeper issues made obvious by this situation will be addressed with immediacy, courage and effectiveness. We acknowledge that the pain being experienced today has not emerged out of this single incident but is rather a part of a much larger universal cry for justice. The Seventh-day Adventist Church is a mainstream Protestant church with approximately 18 million members worldwide with more than one million members in North America. The Seventh-day Adventist Church, following the example of Jesus Christ, seeks to enhance quality of life for people everywhere. Their lives will illustrate both faith in God and the church's commitment to the betterment of all human beings. Intentional leadership and mentoring is a strategic part of the program for the Night Hawks Pathfinders from the New Hope Church in Fulton, Maryland. This Saturday, August 16, seven members of their club were invested as master guides at the “Forever Faithful” International Pathfinder Camporee in Oshkosh, Wis.
Another Pathfinder who was invested with her master guide was 77 year old, Gloria Dixit from the Night Hawks. Dixit lives in both Maryland and Toronto, spending time in each location to be near family. She earned most of her master guide qualifications back when she attended Spicer College in India. After she had raised her children and had grandchildren she decided it was her turn. “I always wanted to do master guide,” said Dixit. To complete the qualifications she had to take wilderness survival and went camping in the rain for four days. From 1979-1992 Dixit also worked with Pathfinders when her family was involved. Link to Pathfinder Master Guide requirements. The Oklahoma Conference entrance features a massive replica of a feather headdress that reflects the rich Native American heritage of Oklahoma and its “natives” of all races. 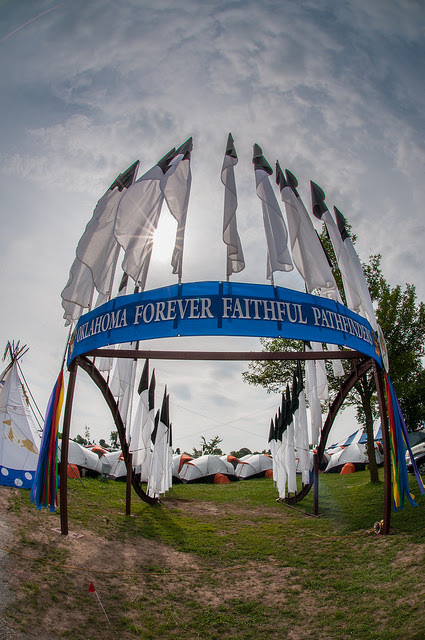 You can walk right through the headdress and into the sea of matching tents that shelter the 467 Pathfinders from Oklahoma. Each of the 17 clubs from the Oklahoma Conference has its own identifying feather from the headdress, representing both regional unity and unity in Christ. Like many conferences from the North American Division, the Oklahoma Conference hosts Pathfinders and church dignitaries from other countries for the camporee, providing space and supplies and “putting more water in the soup,” so to speak, so others outside the NAD can more easily attend. This welcoming spirit makes it possible for many Pathfinders from around the world to participate who might otherwise be left out. This year, the Oklahoma Conference is hosting church officials and youth leaders from the Korean Union Conference. 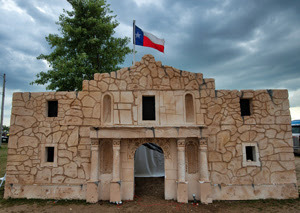 Next door to the Oklahoma headdress is a replica of The Alamo that serves as the entrance to the Texas Conference campsite, where 4,400 Pathfinders and leaders are gathered. It took Johnathan Coker, a former student of Southwestern Adventist and Andrews Universities, between 300 and 400 hours to build the entrance out of 4-by-16-foot pieces of expanded polystyrene foam (EPS), paint, and a lot of special-order glue. He worked from high-resolution photos of the actual Alamo, building it half-scale to the original. According to Armando Miranda, associate youth director for the Texas Conference, it’s about building other beautiful things as well. “Pathfinders is one of the most important youth evangelism programs we have in Texas,” he says. “It’s a vibrant ministry. In the past three years we’ve baptized more than 100 young people.” In essence, building beautiful entrances represents the process of building a beautiful kingdom for God. The Potomac Conference entrance is another stand-out this year. 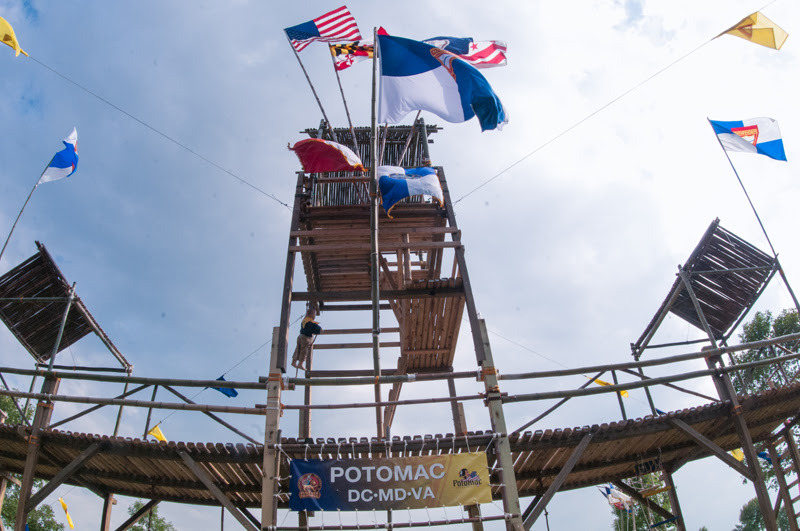 A small army of conference volunteers came to Oshkosh ahead of time to erect a three-story, fort-like structure out of local wood and hand-lashed bamboo with an “eagle’s nest” that offers a stunning 360-degree view of the campgrounds. Harold Linzeau, area coordinator for the Potomac Conference, says the idea behind building the structure was to invite interaction with passersby. The structure provides an almost irresistible invitation to climb. 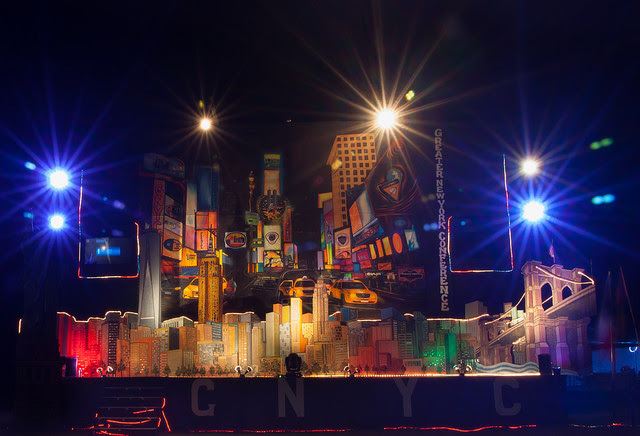 Large or small, each club or regional sign or entrance represents an invitation to connect and to join together in building a beautiful kingdom that will last for eternity. In a world where people typically want to sell you something, there are a few booths at the “Forever Faithful” International Pathfinder Camporee in Oshkosh, Wis., that want to share. If one were to wander around Hangar A you would find Adventist Mission, HOPE Channel, and Middle East and North Africa Union who each represent service opportunities for the Seventh-day Adventist Church. Adventist Mission created a place at their exhibit where Pathfinders could come, try on hats from different parts of the world, and take a photo with their camera or phone. Another very popular exhibit booth to visit is the HOPE Channel. Instead of pin trading, HOPE Channel created a TAG hunt where participants search throughout camporee for tags from North America, South America, Europe, Africa, Asia, Australia, and Antarctica; with clues from their TAG HUNTER booklet. The Middle East and North Africa Union is sharing awareness of their unique mission field to the Muslim culture and how Pathfinders can be involved. Many have painted their thumbs and imprinted the map wall that is used as a backdrop for the booth. The exhibit also invited responses on mission and want people to respond in a heart language. Other ministry exhibits at Camporee include the Just Claim It Prayer Wall. Pathfinders can sign their name and prayer request on the wall and those working the booth for the North American Division Youth Department will pray over those names and requests. They will even take your photo at their exhibit. ADRA (Adventist Development Relief Agency) also has a ministry exhibit nearby in Hangar C. They encompass the entire back part of the facility and their goal is to educate Pathfinders that not everyone has a grocery store with packaged broccoli nearby. Their exhibit shows realities of life like how to obtain clean drinking water and the necessities of a latrine. ADRA searches out deprivation, social injustice, and need – and then works to eliminate them. Adventist World Radio (AWR) has an exhibit at camporee for the very first time. They really wanted to broaden their awareness, says Shelley Nolan Freesland, communication director for Adventist World Radio. Their exhibit is outside near the hangars and consists of a rock climbing wall and a tent where people can take a quiz to learn more about AWR. It was 8:40 a.m. and 17-year-old David Nazaire realized he didn’t have his shofar. He ran straight across the massive campground and returned to a hangar to meet his club, the Hackettstown/Rockaway Guardians from New Jersey, at 8:58, just in time. Each day during the Forever Faithful International Camporee at 9 a.m., Noon and 6 p.m. Nazaire and hundreds of others scattered around the campground play a shofar, alerting the people around him that it is time to pray. Playing the shofar is hard says Nazaire, a trumpet-player who says he’s learned the trick, to blow it from the side of his lip. “It just takes practice," he says. 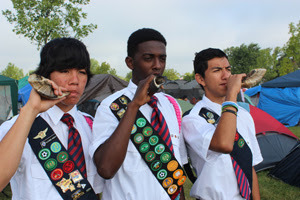 Nazaire’s pastor, Jorge Coxaj, gave him and two of his friends shofars at the beginning of the camporee and asked them to play it three times a day. Each Pathfinder club at the event was given a shofar, and campers enjoy the daily reminders they bring. Landon Mercer, a 10-year-old member of Capitol City Ambassador Pathfinder club from Olympia, Wash. had a chance to play the shofar and says that playing it is harder than playing the trumpet, but he likes it because it’s loud. And he likes loud things. 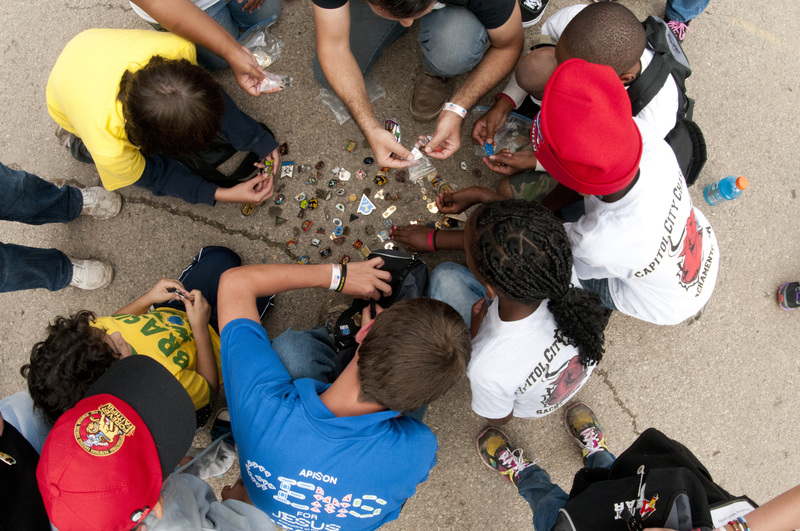 Pathfinders at the “Forever Faithful” International Pathfinder Camporee in Oshkosh, Wis., cannot go anywhere without someone approaching and asking if they want to trade pins. The exact number of pins traded is unknown but the passion for trading is very visible. Steve Durant, with the Timberwolves Pathfinder Club from Westminster, Md., says, “Pin trading allows you to meet new people that you don’t really know even if the relationship only lasts for a few seconds.” Durant came to camporee with 20 pins but has traded for many more. “Esther” Jung Kyue Young, from Korea, is the director of the Oseo Pathfinder club. 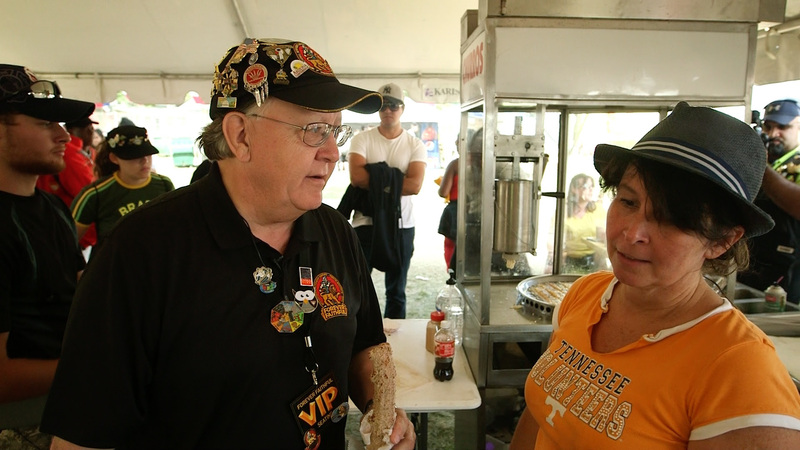 She makes friends by trading pins and even gave out 100 fortune bags to new friends. She plans to go home and give the pins to her club. “The pin trading secret is to make sure the other person walks away happy with the trade,” said Don Adams, Pathfinder Director of the Edmond, Oklahoma club. Some of the most sought after pins to trade at camporee include: the Pacific Union Conference pin that opens with a panoramic view; a trio set of badges from Potomac Conference; and the Beltsville, Md. Bronco white horse pin. Pathfinders not only trade pins but they can also purchase them from The Pin King booth in hangar A. Pins cost from $6-$10, and they sell about 60 different pins, many as sets. 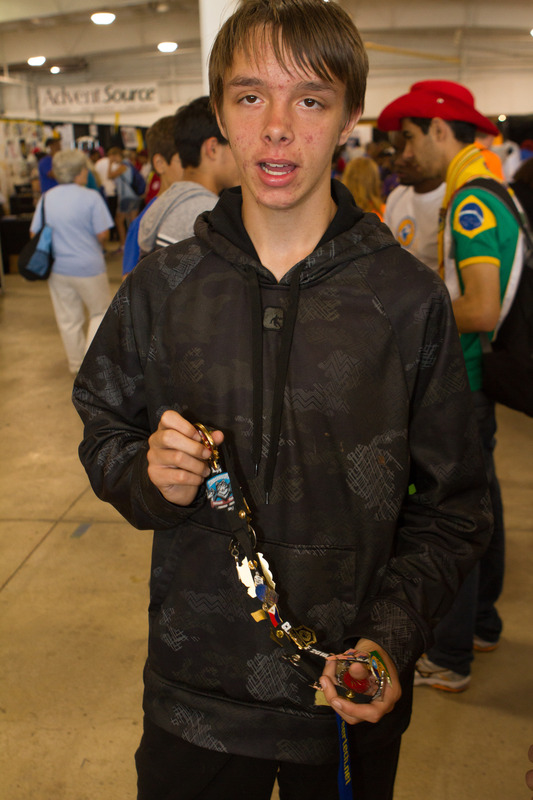 Mark Miosi, who owns an audio/visual business, owns the booth and loves to design and sell pins. In 1999, Miosi attended camporee and fell in love with pin trading. 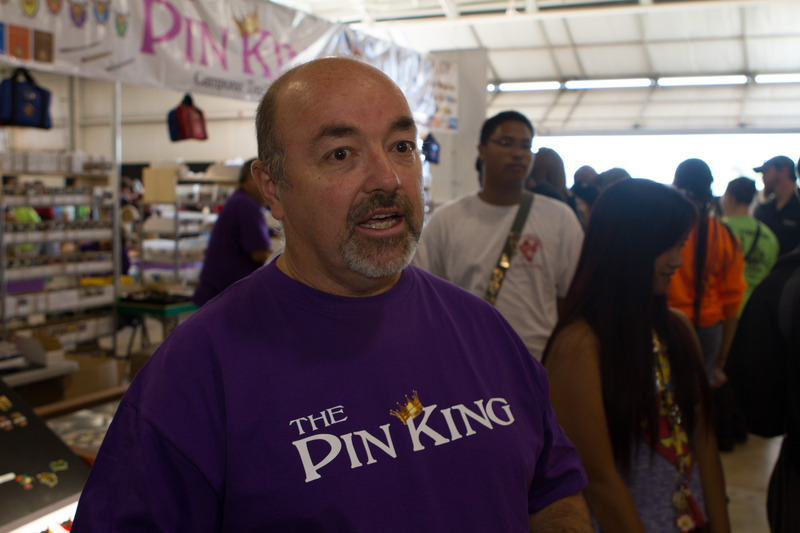 In 2004, he opened The Pin King booth and has been back every camporee. Miosi advises which pins have more value: pins from this year’s camporee; a basic pin that has extras dangles, spinner and/or blinkies; and limited edition, staff only pins. Pathfinders can also earn a Pin Trading Honor sponsored by the Georgia-Cumberland Conference. There is a list of 14 requirements including: what pins can be worn on your Pathfinder uniform or sash, what are the three “F”s of pin trading, and make trade pins with 10 different people, eight of which must new friends. In between pin-trading, earning honors, and exploring the massive exhibit halls of the Forever Faithful International Camporee, more than 60 pathfinders piled into a yellow bus Thursday morning, headed for the Salvation Army Community Center in Fond du Lac. The outing was one of the many community service events planned during the camporee. Other clubs spent the morning making arts and crafts with children at the Neenah Public Library, cleaning up the Winneconne lakeshore, volunteering at the Lutheran Homes and Health Services in Fond Du Luc, among other projects. But at the Salvation Army Community Center, clubs from Colorado, Virginia and New York pulled weeds, cleaned windows, loaded boxes into trucks and packed lunches. The tasks may seem menial, but they mean a lot to the Salvation Army staff. The Fredericksburg Patriots from Virginia, unloaded a truck full of seasonal supplies for Michael Detert, thrift store manager, saving his staff almost two hours of work. The Orange Prayer Warriors, also from Virginia, pulled weeds and washed windows, finishing tasks that would take a Salvation Army staffer more than four hours, says Connie Millard, community development director. “As the weeds grow people would walk past and wonder if things are okay, is there life happening there,” says Millard about their need for help cleaning up the facility. “They took what would have taken hours for staff and allowed us to do what we need to do and still make it (our office) beautiful,” she says. “It shows our neighbors we are here and care,” says Millard. But these service projects do more than help the community, they help the pathfinders live out their faith. David Skrowbowski, a TLT in the Oakwood Knights Pathfinder club in Taylor, Mich.’s club helped clean up the grounds of the Lutheran Homes and Health Services in Fond du Lac. “As Christians our ultimate goal over everything is serving others, which is ultimately serving Christ in the end,” he says. 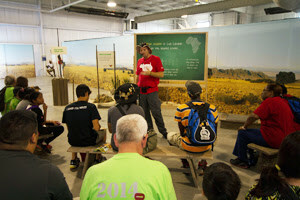 People travel in a variety of ways to reach the Forever Faithful International Pathfinder Camporee held in Oshkosh, Wis., August 11-16, 2014. 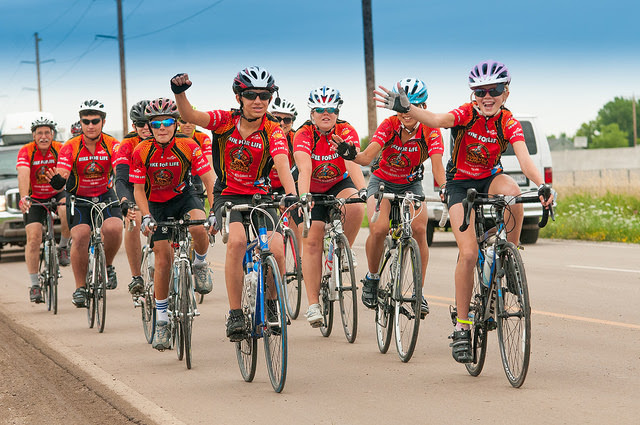 Many spend hours and arrive by bus, Pathfinders from other countries travel via airplane, but eleven Carolina Conference Pathfinders rode their bikes. Ranging in age from 13 to 67, the Bike for Life group from the Carolina’s pedaled 830 miles to attend the international event. The group left Asheville on July 27 and arrived in Oshkosh on August 12 around 12:30 pm. According to rider Brian Aalborg, from Charlotte, the bike riders average 60 miles per day, with 110 miles on a long day and 40 on a short day. The group stayed in Adventist churches and schools or other faith community locations along the way and even took time to stop in Battle Creek, Mich., to tour Adventist village. They also took Sabbath off from riding. “When I stared the ride I had not been on a bike for 6 weeks,” said Kathy New, who attends The Gate church in Canton, North Carolina, and sits on the Pathfinder Council for the conference. “The kids realized I could not keep up and the boys would ride in front on me and break the wind. The girls would say, ‘Come on Ms. Kathy. You can make it.’ It really encouraged me.” When people would find out one rider was 67 and that New was 64 they were surprised. New said the first ride took place in 1999. The group was so impressed with the changes for both Pathfinders and adults that they decided to make the Bike for Life an annual event and they have done so every year, except one. The Pathfinder group rides for one week each summer to locations in the Carolinas and beyond. A challenge for Zinke along the trip was securing his cell phone to his bike. He tried three different devices and finally created his own with a belt clip. He is a mechanical engineer by trade. The group also gave away Forever Faithful Tour brochures that share health information and websites directing people to Bible studies and health sites.